Intelligence agency says terrorist who stabbed soldier quarreled with husband on Sunday night, hoped to die during terror attack. 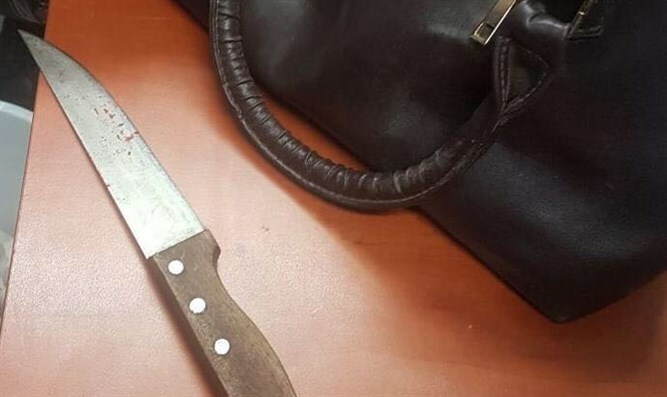 The terrorist who stabbed a soldier on Monday morning at the Qalandia crossing has been identified at Asya Kaabana, 41, who lives in the Shechem (Nablus) area town of Duma, the Shin Bet security agency reported. Kaabana is married and a mother of nine children, and recently has had marital problems, resulting in her husband threatening to send her back to her family in Jordan. The Shin Bet also discovered that the terrorist argued fiercely with her husband on Sunday night over their children's education. This argument caused the woman to decide to carry out a terror attack, hoping Israeli security forces would shoot her, since, "she was sick of her life anyway." A female security guard was lightly injured in the attack. She has been transferred to Hadassah Ein Kerem Hospital for treatment. Initial investigations show the terrorist was waiting at the checkpoint, and requested to approach the security guard "in order to ask a question." She then pulled out her knife, quickly approached the guard, and stabbed her. Police officers and security guards overtook the terrorist and neutralized her.